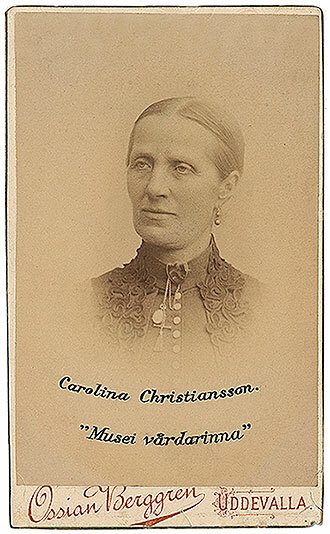 Carolina Christiansson was curator and general factotum at Uddevalla Museum (now Bohuslän Museum) from 1864 until 1912. Nearly half a century. Here you can read about the dramatic prelude to Carolina’s career, about her work and about being a woman in the man’s world of the nineteenth century. What was Uddevalla like in the 1860s, when the museum arrived? 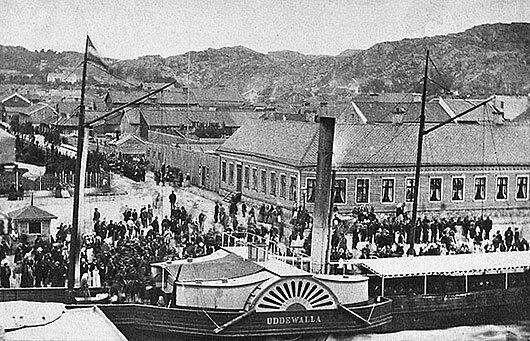 The paddle steamer “Uddewalla”, about 1864. From the harbour came the steam whistle of the paddle steamer Uddewalla, which made regular trips to Gothenburg. The fastest steamer in the land, in fact. Suddenly it was easier to travel. A railway was being built between Uddevalla and Herrljunga, from where one could travel on the main line linking Gothenburg and Stockholm. Street lighting worthy of the name had been installed in 1859. In the darkness 104 gas lamps fluttered. Streets and squares were surfaced with cobblestones and people no longer needed to splash through mud every time it rained. Drinking water was conveniently available in a trough on Södra Hamngatan at Hansson’s Bridge. The water flowed down from Sörkällan in pipes made from hollowed out tree trunks. People read Bohus Läns Tidning. Hallman’s bookshop was a cultural oasis. Hallman also had a large lending library. Romances and whodunits were popular. The beautiful theatre was opened in 1862. Bishop Björck was making Uddevalla the great stronghold of schartauanism. How did the museums of western Sweden rate in the 1860s? In the schools, natural sciences were doing well. The grammar schools in Skara and Vänersborg, not so far from Uddevalla, built up collections of study objects for their students. Stuffed animals, snails, minerals and a great deal more. The collections soon developed into public museums. Gothenburg Museum was founded in 1861. In Uddevalla the book dealer Hallman believed that there should also be a museum here. He presented a proposal in 1861. Many responded with enthusiasm. An invitation to become members was distributed to hundreds of people in Bohuslän. They were to make a contribution “by sending in such objects as are suitable for a Museum.” Preferably from the field of natural history or “ancient objects”. The invitation was signed by the town’s chief medical officer, Åhlström, the wholesaler Robert Thorburn, grammar school principal Rodhe, and the book dealer Hallman. Four real heavyweights. They got a good response: more than 400 people wanted to be involved, and the donations streamed in. Uddevalla Museum at Kungsgatan 30. The museum had a committee of seven people. Three of them were women: Elise Nomell, Lydia Kullgren and Minnie Natt och Dag. Knowledgeable and interested members took charge of the Museum’s various departments. The county agricultural society gave financial support. 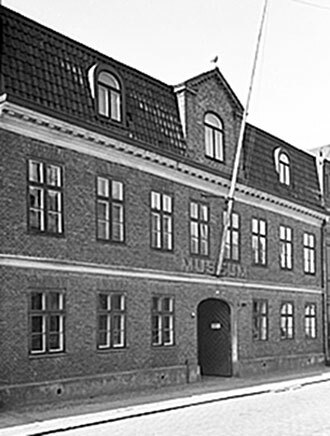 In 1863 the Museum was able to move into the building at Kungsgatan 30.
Who was most important at Uddevalla Museum? Yes, of course, it was the curator, who dealt with the animals collected. The taxidermist C. O. Andersson from Gothenburg was engaged in 1861 for six months to stuff animals. ”Stuffing tools” were procured. Pharmacist Fahlström donated chemicals and other essentials. Andersson was also there when the Museum moved into Kungsgatan 30. But he turned out “unsuitable for the position”. The new curator and caretaker was Niklas Christiansson, appointed in 1864. He had previously been a farm labourer and a textile worker, so he was now taking a step upwards. He had “as well as a certain handiness, also a sense of order and zeal in whatever he undertakes”. Niklas was married to Carolina and they had two small children. The family could take a bright view of the future. But only six months later Niklas Christiansson fell sick and died. His wife Carolina was left in shock with Gerda, 4, and Carl, 1. What was she to do? Carolina had had a wretched childhood. She was prepared to fight and wanted to stay at the Museum. She had the same admirable qualities as Niklas and everything indicates that she had helped him at work. The Museum committee could consider her! A position was advertised “for which both women and men may submit applications”. And the widow beat off a farmworker, a tailor, a copying clerk and also the taxidermist C.O. Andersson from Gothenburg, who of course “was regarded as unsuitable for the position on the strength of previous experience”. The committee now turned to August Wilhelm Malm, head of the zoological department at Gothenburg Museum. Was he willing to instruct a woman in the art of preparation and conservation for a few months? He replied that he had nothing against instructing a woman. The matter was decided. What a relief to Carolina Christiansson! Can she have imagined being the “curator” at Uddevalla Museum for 48 years. She never remarried and did sterling work, grateful for the opportunity she had been given. August Wilhelm Malm became known for having mounted the blue whale that drifted ashore in Askim Bay in 1865. Here it is shown on display at Gothenburg Museum towards the end of the nineteenth century. 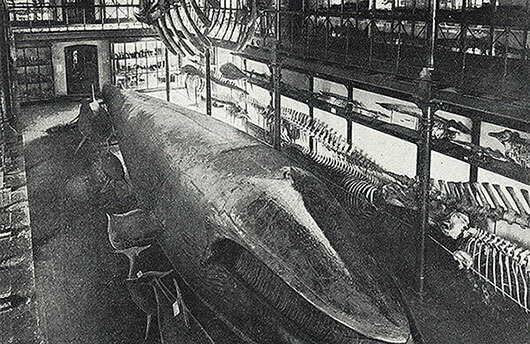 In 1923 the whale was transferred to Gothenburg’s new Natural History Museum in Slottsskogen, where it remains to this day. Carolina spent a lot of time preparing newly arrived birds, fish, insects and mammals. She had a good knowledge of ornithology and zoology and the museum committee recorded in its minutes that it appreciated her work and “the excellent order and method that always prevailed”. She was not only a good curator, she also did most of the everyday work of the Museum. Carolina paid study visits to Gothenburg and other museums. These trips were encouraged by the committee. She became synonymous with Uddevalla Museum, where she lived with her children in a single room with a kitchen. Did she have anyone to help her with housework and childminding, as a widower would have had? Could she afford it, on her small salary? Death and grief hit the family a second time when her daughter Gerda died at the age of 14. But her son Carl grew up and was able to help as a watchman at the Museum. Then he found a job with a company in Uddevalla. Thanks to the proprietor, Carl could afford to go to grammar school and pursue further studies. He went to sea and enjoyed an exciting life abroad. Eventually Carl settled in Paris as editor of the New York Herald’s Paris edition. The paper was famed for having funded two of Stanley’s expeditions to Africa. Carl did not forget the Museum back home in Uddevalla. He sent exotic objects from Pompeii, Palestine, Cyprus, Carthage and Egypt. One of the committee members was Mrs Elise Nomell, and in the autumn of 1869 she proposed that the Museum should buy two live reindeer from a travelling menagerie. The reindeer were displayed in the Museum gardens. But they ate loads of lichen and they became expensive. The following year the animals were slaughtered and then mounted by the curator. She had mounted large animals before: an elk for Vänersborg Museum och and another for Uddevalla. 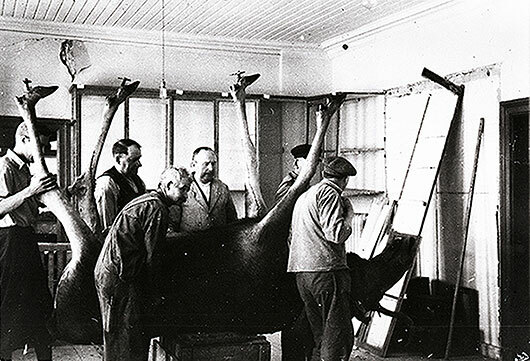 The elk that Carolina Christiansson mounted was manoeuvred away to a new position when the Museum’s exhibitions were reorganized in 1935. More live animals, including two peacocks, a fox and a hawk, were kept in the gardens. All were eventually killed and stuffed. The collections were enlarged with the addition of a bear and a lynx, which were made ready at the museum. In 1912 Carolina reached the age of 80, and she felt that it was quite time for her to retire. The museum committee thanked her with a dinner in the banquet room of Grand Hotell. Some of her relatives and friends were also present. The committee chairman, Anders Zachau, made a speech and toasts were proposed in champagne. Carolina was awarded the gold medal of the Royal Patriotic Society. 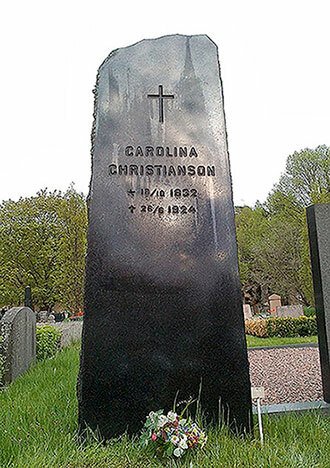 Carolina Christiansson died at the age of 92. She was buried in Norra Kyrkogården in Uddevalla. In Carolina Christiansson’s day there were many unmarried women in the community. It was realized that they had to have a reasonable possibility of supporting themselves. It was a time of change and heated debate. Society was being rocked to its very foundations. Slowly ways were found for women to study and to pursue such qualified careers as those of doctor and grammar school teacher. They also found work on cash desks, telephone exchanges, behind typewriters in the offices, in shops and in factories. Museum curator was a new profession, with no male tradition. This made it easier for Carolina Christiansson. The profession of curator is reminiscent of another new profession, that of photographer, which offered opportunities to many women. At the end of the nineteenth century there were seven female photographers in Uddevalla with their own studios. They also had female employees. Here you can study the Museum’s collection of artefacts that have connections with Carolina Christiansson.